It was one of Apple's worst kept secrets ever, but Steve Jobs still saved the video recording iPod nano as this year's "one more thing". The new nanos sport 640x480-pixel, 30fps H.264 video recording, with AAC audio, on a larger 2.2-inch, 240x376-pixel LCD screen. The nano now comes with an FM radio, including live pause, a microphone and speaker, and a built-in pedometer. Video can be shot in either portrait or landscape formats, with 15 real-time special effects: Sepia, Black and White, X-Ray, Film Grain, Thermal, Security Cam, Cyborg, Bulge, Kaleido, Motion Blur, Mirror, Light Tunnel, Dent, Stretch or Twirl. After synching with iTunes, clips can be uploaded to YouTube, MobileMe, Facebook or via email. As well as live pause, the FM radio has iTunes Tagging to let you tag broadcast songs, and then preview and purchase that song when they sync to iTunes - a feature first seen on Microsoft's Zune music players. The built-in pedometer will keep track of steps taken and calories burned, and means you no longer need the Nike+ sensor in your trainers - although Apple did say that it will synch results with your Nike workouts. Other features include voice memo recording, Voice Over to read out song names and titles (also found on the iPod Shuffle) and never-ending Genius Mixes. 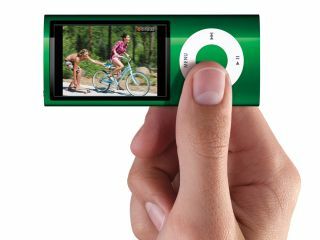 The new iPod nano is available today in an 8GB model for £115 and a 16GB model for £135. It comes in nine colours - silver, black, purple, blue, green, orange, yellow, (Product) Red and pink.